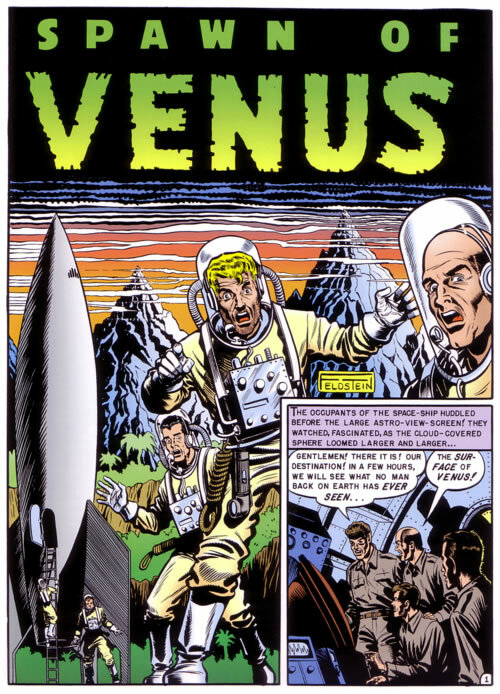 Today we have yet another version of the previously mentioned story Spawn of Venus, this one by Al Feldstein! Courtesy of Entrecomics. I like Feldstein’s stuff, but seeing him compared so directly to Wood does not do him justice. Apparently this version ran in the Feldstein edited Weird Science #6. I don’t know why they chose not to use the Wood version… Wood’s version apparently didn’t see print until its inclusion in Witzend #6 (1969). There are differences in the script as well. If anyone has more of the poop on this, please do elaborate in the comments. Click the image below to go to the comic. Diamonds in the rough. Thurday story day.